San Diego State will face Ohio in the Frisco Bowl Wednesday in Frisco, Texas, in a matchup of teams going in opposite directions. The Aztecs (7-5) have lost three consecutive games and four of their last five following a 6-1 start. The Bobcats (8-4) have won five of their last six games. “We have a lot to prove because we know the last few games didn’t go the way we planned,” said Juwan Washington, San Diego State’s leading rusher with 870 yards despite missing 4 1/2 games because of a broken collarbone. The Aztecs concluded the regular season with a 31-30 overtime loss to Hawaii Nov. 24, their 10th consecutive game decided by single digits. The streak is the longest consecutive streak among Football Bowl Subdivision teams since at least 1980. This will be the first meeting between the teams. San Diego State is 13-0-1 against Mid-American Conference teams. This is the ninth consecutive season the Aztecs have played in a bowl game, matching the 12th-longest streak in the nation. San Diego State is among 14 teams that will be playing in a bowl game for the ninth consecutive season. This is the second consecutive season the Aztecs will play in a bowl game in Texas. They lost to Army, 42-35, in the Armed Forces Bowl in Fort Worth last season. 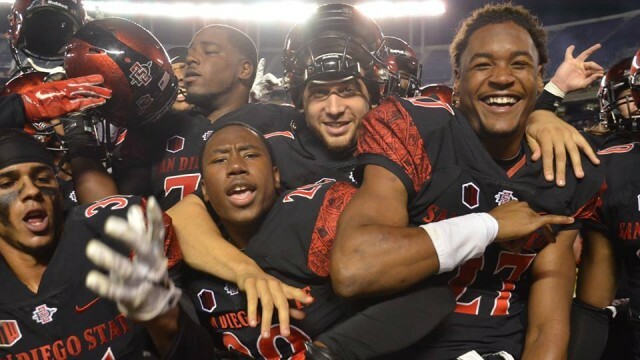 San Diego State will be making its 17th bowl appearance, 13th in Division I play. The Aztecs have a 8-8 bowl record, 5-7 in Division I. The game will be the second edition of the Frisco Bowl. The former Miami Beach Bowl was relocated to 17,200-seat Toyota Stadium last year. The stadium also serves as the home of FC Dallas of Major League Soccer and has been the site of the NCAA Football Championship Subdivision Championship since 2010. Frisco is about 25 miles north of Dallas. It was the nation’s fastest growing city between July 1, 2016, and July 1, 2017, among cities with at least 50,000 residents on a percentage basis, with an 8.2 percent increase to 177,286, according to Census Bureau figures. Frisco bills itself as Sports City U.S.A. because seven professional teams either play or practice there, including the Dallas Cowboys, and it has extensive youth sports facilities. Frisco is also the home of the National Soccer Hall of Fame.